While I am on vacation in Greece for the week I’ve lined up some great guest posts for you! It is the start of the Jewish holiday of Sukkot/Sukkoth and I’m thrilled that today’s guest post is a wonderful Sukkot-appropriate cake from Georgette over at Chocolate and Figs. Sukkoth will always be a holiday I can reminiscence about for many reasons. As a teenager, I had never heard of Sukkoth. I had also never heard of a country called Israel, or that there was a place where most people were Jews. I hardly knew what being Jewish means. Why was I so ignorant? – You may ask. Ignorance had nothing to with it. I grew up in a communist country at a time when communism was at its peak. The leaders of the Party (and actually the country) were the strongest, meanest, and the most dangerous group sort of people. My parents needed to protect their children from the evil that could happen if the wrong word was said in the wrong place. They did this the only way they knew how – by keeping us uninformed about our religion, our heritage, our history and anything else that could jeopardize the entire family. It is a long story and this post is not the place to go into it; perhaps one day I will write a book about it, but right now I just wanted you to understand why this holiday makes me nostalgic. Once I arrived to Israel, I had the chance to learn all the things (well, almost all) I had missed up to that point. One of my favorite new (for me) practices was observing Sukkoth. We did not have a house, but the apartment had a pretty nice size terrace and that is where we setup the sukkah. It was not the greatest by appearance, but we placed lots of herbs around and their aroma filled the entire sukkah. My siblings and I loved every minute of it. The entire day we prepared to be in the sukkah with our parents, who would come back from work exhausted, but knowing that my sister and I were preparing something good for them for dinner. I recall reading a lot about this holiday’s tradition, history, foods and local customs. So we learned that this holiday is actually a celebration of harvest; therefore most days we went to the local farmers’ market to see what is in season and that is how we prepared dinner. Dessert, on the other hand, was a different story. I don’t know why we had lots of dried fruit, when there was plenty of fresh fruit on the market, but that is what I remember. So many of the desserts were built around dried fruits and nuts. Don’t misunderstand me, they were delicious, but I am not sure for the reasons we selected to work with them for desserts. We soaked the fruits either in OJ juice spiked with rum, or forgot about the juice and went straight to the alcohol. That is what I tried to recreate for you here. Dried fruits, as you can imagine, drink the alcohol like crazy. We would watch the alcohol disappearing from the bowl where the fruits were soaking. So of course we added more and more. No wonder we had such a great time in the evenings. Do not worry; I did not add that much alcohol in this cake, particularly since I used my best cognac for soaking. I must add a note here: never, never use any alcohol in cooking or baking that you would not drink! If you do not like the wine or liqueur, you will not like the dish or cake that you used this wine in its preparation. A good quality liqueur will provide the same high quality flavor to the baked goods as the premium liqueur. The other thing I added here is called: fruit jewels (although some chefs call it fruit pate). It is a very popular after dinner sweet in Europe. You can also find them in some of the top pastry or chocolate shop (particularly French ones) where they are sold in all kind of colors, depending on the fruit used in making them (i.e. cherries, raspberries, strawberries, would be red, lime, kiwi, would be green and so on). 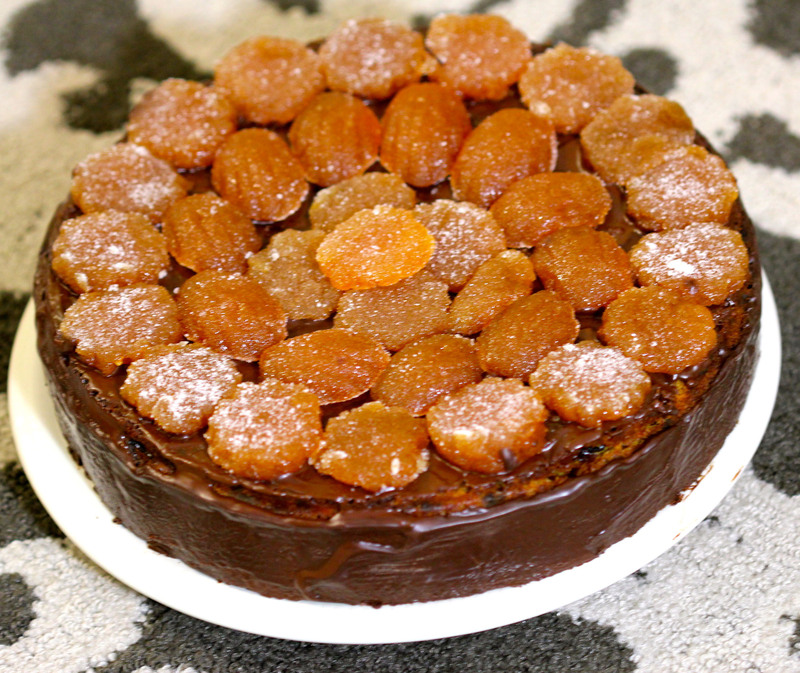 The ones on the cake here are from apricot. But, enough talking (or writing), let’s start to bake. 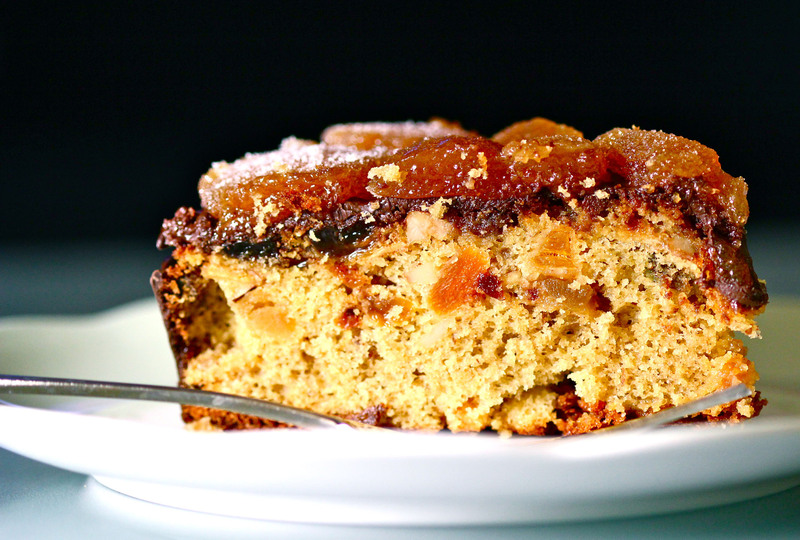 This is so far removed from the stale version of fruit cake you may remember from childhood. Elegant and flavorful, it is perfect for Sukkot or any time that you want to impress guests. Be sure to top it with the fruit jewels for a special treat. Drain the dried fruit, reserving the soaking alcohol, and mix with the flour prior to incorporating them into the cake batter. Position a rack in the center of the oven and preheat the oven to 325°F. Butter an 8-1/2x4-1/2-inch metal loaf pan. (Note: I used a spring form pan, but I think a loaf pan would be better; it would give a better height to the cake) Line the pan with two strips of parchment in opposite directions, leaving an overhang for easy removal of the cake. In a bowl, whisk the flour with the cinnamon, allspice, cardamom, ground cloves, nutmeg, and salt. Mix the oil and both sugars with a handheld mixer on medium-high speed until the sugars absorb the oil. In a separate bowl, whisk the eggs and add the vanilla extract. Add the sifted flour to the eggs and mix it well with a handheld mixer at low speed. Then add the oil-sugar mixture to this mixture with the handheld mixer using low speed again. Finally, fold the chopped crystalized ginger, the chopped nuts, and the drained dried fruit that was mixed with flour and add it to the batter. Make sure that the batter looks uniform color and quite smooth texture before pouring the entire batter into the prepared pan. Tap the pan on the table a few times to make sure no air pockets remain. Also make sure that the top is smooth and in level. Remove the cake and let it cool in its pan on a wire rack for 20 to 30 minutes. Use the parchment overhang to lift the cake from the pan. Place it on the rack, peel down the parchment sides, and cool completely. When cool, brush the cake with 2 to 3 tablespoons. of the alcohol you used for soaking. It is suggested not to eat it the same day that you baked it; just wrap it in a plastic and a foil. Store the cake at room temperature for a minimum of 24 hours before serving. Top with Pate de Fruit (recipe below), if you wish. Put the applesauce, apricots, sugar, and lemon juice into a nonreactive 2-quart heavy-bottomed saucepan over medium-high heat. Mix together, then use a hand-held immersion blender to combine all the ingredients until smooth. As the mixture cooks, the natural pectin in the fruit will cause the mixture to thicken. Continue to cook the mixture until it is thick, mixing constantly. To test it for the correct consistency, dip a whisk in the mixture and hold it horizontally in front of you. Watch as the mixture drips off the whisk and back into the pan. If the mixture stays on the whisk and beads up into small balls, like pearls, it is ready. If it drips back into the pan in thin strands, it needs to be cooked a little longer. When the mixture is a bit thicker than jam, pour it into a spouted container. This will make it easier to pour the mixture directly into the flexi pan. You can use any flex pan with the desired shape, depending on the desired design of the jewels you want to create. I used a small madeleine flexi pan, and some I cut out from a sheet of the “jam” with a cookie cutter. Fill the molds. Let it rest for 4 hours at room temperature. When the mixture has set, remove and roll each jewel in granulated sugar. If you do not have a flexi pan, you can pour the “Pâte” into a bottomless tart mold or cake ring placed on a parchment paper-covered baking sheet. To unmold, run a sharp paring knife between the fruit and the mold. Lift off the mold. At this point the Pâte can be stored, well wrapped in plastic and in an airtight container, for up to 2 months. Sprinkle the top of the Pâte with a thin layer of granulated sugar and flip it onto another sheet of parchment paper. Remove the parchment that is now on top. Sprinkle this side with more sugar. Use a wet chef's knife or cutter to cut the Pâte de Fruit into any shapes. Roll each piece completely in sugar and serve. Do not store it in the refrigerator where the humidity will make the sugar melt. 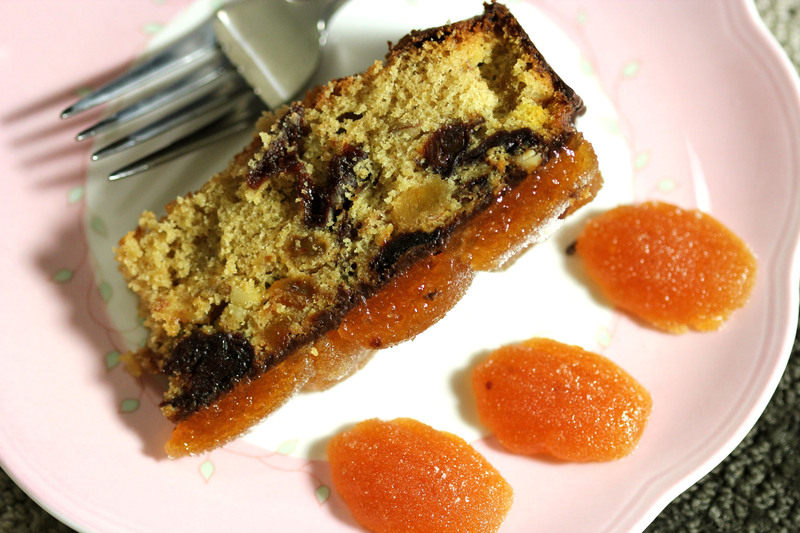 Great story, awesome guest post and wonderful cake… those fuits jewels are delicious, I know it! Thank you Giulia, I so agree! I am so happy that Georgette shared her story here with us. I have also been eying those fruit jewels! I had a wonderful time in Greece, thank you Peggy! This cake does look amazing, doesn’t it?! Georgette always comes up with the most amazing desserts. This is a lovely guest post! And what a beautiful cake for Sukkot. Loved the story and the incredible recipe. What a great post! Perfect way to celebrate the harvest. Happy Sukkot. Happy Sukkot to you too Judee! I am so glad that Georgette was able to share her recipe and story here. Thanks for an inspiring article! It’s great someone is sharing, and your insight and expertise is appreciated! I am looking for a good technique to fry salsa chips. I can never get a good consistancy! By the way, I really like the post, what theme are you using? If you’re ever in Louisville, you should check us out! Georgette, I really enjoyed this guest post, informative, interesting and stunning looking cake. I totally agree Sarah! I am so happy that Georgette shared here. Never being one for fruitcake, due to the reasons mentioned above, I must say, this IS one delectable looking fruit cake. I think it’s time to have another go at it. Lovely guest post! I agree! Fruitcake has such bad connotations, but this one looks like it could turn that all around. A person necessarily help to make significantly articles I’d state. This is the first time I frequented your web page and so far? I surprised with the research you made to create this actual post incredible. Fantastic process!